There has been a dramatic increase in the use of oil trains over the past decade, putting communities, wildlife, and the environment at risk. When trains carrying Bakken Crude oil derail, they not only catch fire, they explode (See Bakken Oil Shale Basin). Many communities that are faced with these trains coming through their town see them as a ticking time bomb. It is not if the oil train will derail, but instead when the oil train will cause a disaster. Rebecca Ponzio, who I interviewed for this project, is the oil campaign director at the Washington Environmental Council. She directs the “Stand Up to Oil Campaign,” a broad coalition of organizations and interested parties who are fighting the oil industry plan to bring crude oil into the Pacific Northwest. Ponzio stated that, “The risks are many, and they are not theoretical unfortunately.” These trains are constantly derailing and the derailments could be within a community, near a river, or a water supply. Derailments can also cause leakage, which results in the oil getting into the water system and the soil. Even if a train does not derail, there are still impacts caused from the train simply going from point A to point B. 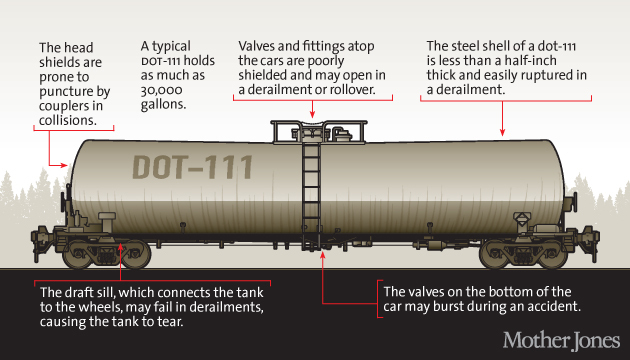 The length of an oil train is up to a mile, and the extremely heavy rail cars put stress on the railroads, leading to wear and tear. When the trains go through such populated areas, they can increase traffic congestion. Because they are so long, they stop traffic, including emergency vehicles, for a massive period of time, Ponzio mentioned, “We’ve heard from emergency responders that they actually had to wait to get to the call they were responding to because of these long trains, oil trains.” On top of causing congestion, these trains are also known to leak and release volatile compounds, along with the diesel emissions from powering the trains. According to Ponzio “There is not a safe and effective way to contain these compounds” and these are all issues that occur without the train derailing in the first place (Elliott / Ahearn). These companies are showing no evidence that they can transport this fuel safely. Along with the old and inferior tankers, there is also the issue of the conditions of the railroads they travel on (Stern). I asked Ponzio how often the rails are inspected, and she explained that “The answer is extremely complicated for such a simple question.” It depends on the infrastructure and it varies state by state. Ponzio explains that these inspections are typically not available to the public: “It’s not required to share their inspection schedule with the public, so it would need to go through the oversight agency at the federal or the state in order to get public access to that.” If the public has no access to this information there is no way for us to be sure of our own safety. Some companies are unable to even pay for these accidents (De Place). For example on July, 6 2013 in the town of Lac-Mégantic, Quebec, “An unattended 74-car freight train carrying Bakken formation crude oil rolled down a 1.2% grade hill from Nantes and derailed downtown, resulting in the fire and explosion of multiple tank cars. Forty-seven people were confirmed dead” (BBC News). According to Ponzio, the rail company went bankrupt because they were unable to pay for the damages caused by the derailments and left the burden to the Canadian government and people, who became responsible for cleaning up an overwhelming mess. To look at the impacts from a different point of view, we could assess them from an economic perspective. For example, if another train was to derail in a popular area (such as the Columbia Gorge) and cause damage, the tourism dollars that area brings in would be diminished. “That’s not going to be a destination, except for the people cleaning it up,” Ponzio observed. Oil is an major contributor to the production of carbon dioxide, which is causing climate change. People all around the world are beginning to realize that climate change is our most imminent threat. We can no longer support oil companies that contribute to such a major threat. There are much more effective and safe ways to produce our energy. 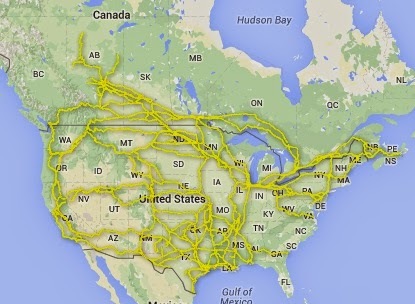 I do understand oil trains are not the main cause of climate change, they are however a key piece of the puzzle. If we do not invest in clean and renewable energy, I am frightened to see what the world we live in will become. There is a long list of changes that must be made to address this issue, starting with keeping fossil fuels such as oil in the ground. The number of variables that can affect whether a train will derail are too high. We can no longer put our environment and our communities at risk. Ahearn, A. (2015). Growing oil train traffic is shrouded in secrecy. Reveal News. Elliott, B. (2014, April 10). Oil-by-rail traffic causing delays to farmers, Amtrak passengers. Huffington Post. BBC News. (2014, May 13). Lac-Megantic train explosion: Three charged in Quebec. BBC News. Place, E. D. (2015, October 19). Grays Harbor oil trains would be severely underinsured. Sightline Institute. Stern, M. (2015, November 10). Half of surveyed oil train bridges are deteriorating, report says. Aljazeera America.